← The recruitment of armies in the early middle ages: what can we know? Without doubt, the rapid development of fortifications against artillery during the Wars of Italy, the concomitant improvements in siege and field artillery, and the subsequent growth of army sizes all play important roles in answering Parker’s question. So, too, do the reforms of Maurice of Nassau and Gustavus Adolphus. All of these aspects of the Military Revolution have been considered at some length by the works cited above. I believe, however, that the focus on the centuries after 1500 obscures the importance of the period in which the most dramatic, most truly revolutionary changes in European military affairs took place: the period, roughly, of the Hundred Years’ War (1337-1453). The armies that dominated the battlefields of Europe from the mid-eleventh century through the early fourteenth were composed primarily of feudal warrior-aristocrats, who owed military service for lands held in fief.9 They served as heavily armored cavalry, shock combatants, relying on the muscle power of man and steed, applied directly to the point of a lance or the edge of a sword.10 They fought more often to capture than to kill. The armies which conquered Europe’s first global empires, on the other hand, differed from this description on every single count. They were drawn from the common population (albeit often led by aristocrats); they served for pay; they fought primarily on foot, in close-order linear formations which relied more on missile fire than shock action; and they fought to kill.11 The tremendous revolution in warfare represented by these changes was well underway by the middle of the Hundred Years’ War, and solidly in place by the end of that conflict. This paper will argue that twice over the course of the Hundred Years’ War new developments revolutionized the conduct of war in Europe, in each case with consequences as significant for the history of the world as those which took place during Parker’s Military Revolution (1500-1800). The first was the transition outlined in the paragraph above, which I shall refer to as the “Infantry Revolution.” 12 The second, the “Artillery Revolution,” occurred when gunpowder weapons reversed the long-standing superiority of the defensive in siege warfare. Each of these transformations fundamentally altered the paradigm of war in Europe, with far-reaching consequences for the structures of social and political life, and thus each truly deserves to be termed a “military revolution” in itself. When we consider that these two “revolutions” were followed in the succeeding centuries by a revolution in fortification (which once again reversed the balance between offense and defense) and then another in the administration of war (Roberts’s original “Military Revolution”), we are led to reconsider whether the answer to Parker’s question can possibly be a single “Military Revolution.” In the last section of this paper, I will address that issue, and propose an alternative paradigm based on the biological concept of “punctuated equilibrium evolution.” In essence, I will argue that Western military dominance derived from a series of sequential military revolutions, each an attempt to reverse a disequilibrium introduced by the previous one, rather than from a single “Military Revolution.”13 First, though, we must consider the warfare of the earlier Middle Ages, and the two revolutions which so dramatically altered its character over the course of the fourteenth and fifteenth centuries. In 1898, C. W. C. Oman described the period from 1066-1346 as the age of “the supremacy of feudal cavalry.”14 Recently, some scholars have attempted to dispute this conception, arguing that “cavalry was never militarily superior to foot soldiers” and that infantry played an equal or greater role on the medieval battlefield.15 It is true that Oman, Delbruck, and other earlier authors failed to acknowledge the significant role of infantry in the High Middle Ages, but the fact remains that “medieval warfare was characterized by the dominant role of the heavy cavalry.”16 At Tinchebray in 1106, Bouvines in 1214, Dunbar in 1296, and Falkirk in 1297 (to consider only battles cited by authors who emphasize the role of the infantry), it was a cavalry charge that decided the battle. Throughout this period, infantry on the battlefield generally acted in a purely defensive role, using a tight formation “like a great wall” of pole-arms and crossbowmen to protect the cavalry while it formed up for a charge. The importance of this “wall” derived in part from the men-at-arms’ practice of riding from place to place on palfreys and mounting their chargers only immediately before battle, making it critically important for them to be protected while changing horses and forming up. To use the metaphor of single combat, the infantry served as a shield to the cavalry’s sword.17 Infantry could be very important, but it could not defeat an enemy unless he bashed his head against it. The new success of infantry forces in Western Europe rested on a number of developments. In the case of the English, the development of the six-foot yew longbow, substantially more powerful than the approximately four-foot Welsh elm bows of the early thirteenth century, played an important role. According to P. H. Blyth,33 for a given draw strength and distance a six-foot longbow stores 25 percent more energy than a four-foot-eight-inch bow. The longbow, however, is drawn to the ear rather than to the chest (as the Welsh bow was 34), increasing draw distance by several inches. Since the draw force of a longbow plotted against draw distance shows a nearly linear relationship, and the total energy stored is equal to the area under that line, each extra inch of draw adds more stored energy than the previous one. Those extra few inches are, therefore, of critical importance. Thus, a six-foot longbow which at a twenty-eight-inch draw had the same draw weight as a four-foot-eight-inch bow, would have a substantially higher draw weight at its full thirty-two-inch draw, and would in total store about half again more energy than the shorter bow at the shorter draw. It seems reasonable to hypothesize that this increase could make the difference between ineffectiveness and lethality when attempting to penetrate an enemy’s armor. Even arrows fired from the strong shortbows of the Moslems in the Crusades of the late twelfth century proved rather ineffective against European armor.35 In contrast, a later medieval writer held that “the most important thing in the world, for battles, is the archers.”36 Of course, the draw weight increased with draw distance, so the longbow required a very strong archer to use it effectively.37 Archaeological evidence shows that some medieval archers used longbows with draw weights up to 180 lbs., and the average was probably around 100.38 England developed a pool of strong yeomen archers over decades of more-or-less constant warfare against the Scots and the Welsh-it is no coincidence that Cheshire archers, considered the best in England, came from the Welsh marches.39 The French, despite numerous attempts, never succeeded in producing a comparable body of skilled archers.40 Indeed, one could argue that France failed to join in on the Infantry Revolution until the late fifteenth century, and that many of her military failures prior to the advent of the Artillery Revolution in the mid-fifteenth century could be ascribed to that fact. The growing importance in the English tactical system of dismounted men-at-arms, who used lances like pikes in a close-order formation designed to stop an enemy’s cavalry charge, was, of itself, a less dramatic break with the past. What made these horsemen on foot so effective was their integration with the archers. Because the English formations had missile superiority, their dismounted men-at-arms could not be dispersed by enemy archers, in the way that the English themselves dispersed the pike formations of the Scots.41 Even so, we must assume that the English victories, combined with the partial success of Flemish pikemen, encouraged others-including but not limited to the Swiss-to develop effective infantry armies, even though not provided with missile troops the equivalent of the English archers. For, once the possibility of victory through common infantry 42 was demonstrated, further experimentation became inevitable. Infantry possessed important advantages over cavalry. A common infantryman could be equipped for much less than a man-at-arms; he was paid less;43 he could be trained more quickly;44 and the ranks of the infantry could be filled from a much broader section of the population.45 Nothing demonstrates the importance of these factors better than the fact that the lone county of Flanders could muster a larger army at Courtrai than could the entire kingdom of France. Because of its broader recruitment pool and lower costs of equipment and training, a military system based on common infantry-and only such a system-could turn surplus agricultural population into large numbers of soldiers for export to the world at large.46 Thus, the Infantry Revolution was a necessary precondition for the European conquests of the sixteenth through eighteenth centuries. On a less elevated plane, the social impact of the Infantry Revolution made itself felt on the battlefield, with remarkable consequences for the European conception of war. War under the feudal regimes of Western Europe in the twelfth and thirteenth centuries often seemed more like sport than serious business. In the Flanders War of 1127, which involved about a thousand knights fighting for over a year, only one died by the hand of an enemy; an equal proportion of the total losses of the war resulted from excessive horn-blowing.61 At Bouvines, which Ferdinand Lot described as “un Austerlitz medieval,” the victorious French are said to have lost only two men-at-arms (out of about three thousand); perhaps seventy to one hundred of the fifteen hundred defeated German knights were killed. At Lincoln in 1217, three knights were killed and four hundred captured.62 Orderic Vitalis tells us that at Bremule (1119), where nine hundred knights of two royal armies came head-to-head, only three were killed.63 Such low casualty figures characterized European warfare before the onset of the Infantry Revolution. The French at Courtrai, in contrast, lost a thousand knights;. in return, they slew some six thousand Flemings at Cassel in 1328.64 Agincourt brought an end to the lives of over sixteen hundred French knights, and perhaps eight thousand other men. Over eight thousand died at Verneuil (1424).65 Without question, the Infantry Revolution made the European battlefield a much more sanguinary place. How are we to explain this contrast? Orderic Vitalis explains the low casualties at Bremule by saying “they were all clad in mail and spared each other on both sides, out of fear of God and fellowship in arms; they were more concerned to capture than to kill the fugitives.”66 He tactfully leaves out what may well have been the primary motive which led them to “spare each other on both sides”: ransom. The phrase “worth a king’s ransom” remains in common use today to indicate a huge sum of money, and with good reason: the ransom of Jean II of France was set at 3,000,000 crowns (£500,000) in 1360. This figure was truly exceptional – equal to some twenty years worth of English ordinary royal revenue 67 – but even lesser captives could bring tremendous sums. Henry of Grosmont apparently received over £80,000 for his share of the ransoms of the prisoners taken at Auberoche and Bergerac; the Duke of Alencon brought £26,666; and Bertrand du Guesclin, the low-born soldier who became Constable of France, brought 100,000 francs (about £11,000).68 Lesser knights brought lesser sums, but still enough to make capturing them far preferable to killing them. Considering these social and technical factors, it is easy to see why the battlefields of the Infantry Revolution became such bloody places. It is hard to overemphasize the consequences of this development. Ever since, Europeans have had an unusually lethal approach to warfare. Geoffrey Parker has outlined the importance of this European conception of war in the European conquests of the early modern period, but he does not identify its origin. He contrasts the “bloudy and devouring” warfare of the Europeans with that of the Narragansett Indians, who “might fight seven years and not kill seven men.”72 As we have seen, the same was true of Western Europeans in the twelfth and thirteenth centuries, but not after the advent of the Infantry Revolution. The Infantry Revolution, however, was only the first of a series of periods of rapid change in European warfare which bring into question the concept of a single, overarching Military Revolution. Even as the Infantry Revolution reached its full maturity, early signs of the next “military revolution” – the Artillery Revolution – began to appear. This account is worth quoting at some length because it concisely sums up the way in which gunpowder artillery was used throughout the fourteenth century. The gunstones were fired into the town, where they knocked down houses and churches, not against the walls.76 The gunpowder artillery was used in conjunction with older forms of siege engines. And, most important, the use of guns did not appreciably lessen the duration of the siege; the defenders still had to be starved out. These events did not yet demonstrate the complete triumph of gunpowder artillery over medieval fortifications. As mentioned above, the siege of Guise in 1424 lasted over a year, and Ferte-Bernard managed to hold out against Salisbury for several months in the same year. In 1429 the English had to spend six months starving out the castle of Torcy; the French garrison of Chateau Gaillard had once again to be starved out that year; the siege of Laigny-sur-Marne took over five months in 1432; and as late as 1440 Harfleur was able to resist an English siege for over three months.103 Each of these places, however, was exceptionally strong, and each was attacked by a relatively weak English siege train. By the late 1440s the Franco-Burgundian artillery could destroy even the most powerfully defended places. Mighty Harfleur, which had held out so long against the English in 1440, made terms after a seventeen-day bombardment in 1449.106 After a sixteen-day siege in 1450, almost the entire wall of Bayeux was “pierced and brought down.” The story was much the same at Dax and Acx: “their walls were so battered in many places that by diverse breaches they could be taken by assault.” At Blaye, in 1451, it took only five days before “the town walls were completely thrown down in many places.”107 A contemporary English document lists one hundred strongpoints taken by the French in 1450, including Chateau Gaillard, St.Saveur-le-Vicomte, Cherbourg, Roche-Guyon, and Rouen, all of which had earlier required long sieges to capture.108 In 1451, all of Guienne fell rapidly to the French despite the deeply ingrained pro-English sympathies of the inhabitants of the duchy. Based on the above accounts, it seems fair to say that a revolution occurred in the art of war around the 1420s to 1430s, as gunpowder artillery overturned the centuries-old dominance of the defensive in siege warfare. What was the nature of this revolution? There is no doubt that the Bureau brothers’ methods were admirable, impressive, and contributed significantly to the success of the French artillery in the middle of the fifteenth century. However, an account of the siege of Harfleur, written in 1416-17, already describes much the same method of approach and bombardment from covered positions.112 Thus, we must look elsewhere for the developments which enabled the artillery of the 1450s to tumble down the walls of the strongest fortresses. It has been argued that gun design remained essentially stagnant until well into the fifteenth century, and that the most important advances were made after the artillery pioneers Jean and Gaspard Bureau became Treasurer and Master of Artillery of France, respectively, around 1440.113 In fact, however, cannon developed steadily throughout the fourteenth century, and very rapidly in the early fifteenth. Indeed, the developments in cannon design most critical for the Artillery Revolution appeared in the years 1400-1430. These developments included changes in the design and manufacture of the guns themselves, in loading methods, and in powder formulation. Further important improvements were made in the 1450s to 1470s, including the general adoption of the modern two-wheeled carriage, trunnions, and iron cannonballs. Large bombards increasingly gave way to smaller, cheaper, more easily transportable guns, particularly cast bronze muzzle-loaders.137 However important these latter changes may have been from a technical point of view, though, it was the earlier changes which held the greatest importance for the actual conduct of operations, as the above analysis of the sieges of the 1410s to 1430s shows. The idea that the introduction of gunpowder led to sweeping changes in the political structure of Europe has been a familiar one from the days of Adam Smith, David Hume, Carlyle, and Macaulay. More recently, J.F.C. Fuller, Ferdinand Lot, and William H. McNeill have made similar arguments.138 Others have tried to refute their case, but the logic of the argument is as powerful as it is simple. Artillery was expensive. As early as 1442, the French government was spending more than twice as much on its artillery train as it spent on more traditional war materiel – arrows, lances, bows, etc.139 The central governments of large states could afford to acquire and maintain large siege trains: their subjects and smaller neighbors, in general, could not. The imbalance between offensive and defensive in siege warfare led to a corresponding inequity in strategy: the offensive gained, the defensive suffered. Under such circumstances, local powers could effectively keep the interference of the central government to a minimum. The Artillery Revolution altered the situation dramatically. Regional interests lost their ability to defy central authorities; small states and semi-independent regions were gobbled up by their larger neighbors. The great cost of artillery, and the larger armies engendered by the growing importance of open battle, put a premium on the ability to produce and manage large amounts of cash. This created a self–reinforcing cycle, which continued to spiral upwards at least until the advent of the Artillery Fortress Revolution of the early sixteenth century. It went something like this: central governments of large states could afford artillery trains and large armies. The artillery trains counteracted centrifugal forces and enabled the central governments to increase their control over outlying areas of their realms, or to expand at the expense of their weaker neighbors. This increased their tax revenues, enabling them to support bigger artillery trains and armies, enabling them to increase their centralization of control and their tax revenues still further, and so on.148 One scholar has estimated that the tax revenues of central governments in Western Europe doubled in real, per capita terms between 1450 and 1500;149 this feedback loop between military capability and economic mobilization ability helps account for that phenomenon. Looking backward from the period of the Artillery Fortress Revolution, more than one scholar has tried to argue that “the view that the advent of cannon changed the balance between the attackers and the fortified defense is simply not supported by the evidence.” 150 The contemporaries of the Artillery Revolution, from Chartier and Leseur to Guicciardini and Machiavelli, did not agree. Indeed, the fifteenth-century Italian architect Francesco de Giorgio Martini wrote that “the man who would be able to balance defense against attack, would be more a god than a human being.” 151 Their accounts, and the other evidence presented in this article, make it clear that gunpowder did reverse the balance between offense and defense around 1430 as the result of a rapid series of technical innovations built onto a century of gradual development. True, this superiority of the offensive itself eventually succumbed to another military revolution – but in the century between the initial triumphs of gunpowder artillery in the 1420s to 1440s and the flowering of the sunken-profile, bastioned-trace earthwork fortress in the 1520s to 1540s, gunpowder artillery wrought a true revolution in European warfare, with great consequences for the continent and the world. Let us return to the question which launched our examination of the military revolutions of the Hundred Years’ War: “just how did the West, initially so small and so deficient in natural resources, become able to compensate for what it lacked through superior military and naval power?” I have argued that in order to answer that question we must turn our gaze back to the early years of the fourteenth century, when the Infantry Revolution reached maturity and cannon first appeared. It is clear that between that time and the end of the eighteenth century, the European military “macroparasite”152 became far more effective than any the world had known before, and that this advancement of the craft of war played a crucial role in the rise of the West to global dominance. But that covers a span of a full half a millennium. The concept of “revolution” in history is a flexible one, flexible enough to encompass phenomena as diverse as the Glorious, French, Copernican, and Industrial revolutions. In each case, though, “revolution” refers to a rapid reversal in the state of affairs. The length of time involved can range from a year to a century, depending on the scope of the revolution – depending on whether it is a government, a social structure, an idea, or an economy which is overturned – but in none of these cases does the time-frame during which the reversal takes place exceed a single (maximum) human life span. Furthermore, a revolution – however extended – must be in essence a single change, from state X to state Y, from front to back or top to bottom. Over the five centuries between 1300 and 1800, however, Europe experienced not one but several military revolutions, even considering land forces alone, each of which dramatically altered the nature of warfare over a short span of time. First, in the fourteenth century, the “Infantry Revolution,” when common Swiss pikemen and halberdiers and English archers overturned the centuries-long dominance of aristocratic shock cavalry. Second, the “Artillery Revolution,” which reversed the equally long-standing superiority of the defensive in siege warfare and provided a major impetus for the unification of France and Spain under central authorities. Third – getting into the period of the traditionally defined Military Revolution, and away from the period analyzed in the body of this paper – the “Artillery Fortress Revolution,” based on the trace italienne and sunken-profile earthwork walls, which reinstated the superiority of the strategic defensive. Fourth, the “Military Revolution” which Michael Roberts outlined in his seminal paper-drill, military bureaucratization, and the growth of army size. 153 We are, thus, dealing not with one revolutionary change, but with a whole series of revolutions which synergistically combined to create the Western military superiority of the eighteenth century. Is the answer to our question, then, a matter of evolution? Evolution normally implies advancement through a near-infinite number of infinitesimal changes, and that, clearly, is not the conceptualization we want. Each of the component revolutions mentioned above, it is true, involved a certain amount of slow, steady evolution both before and after the “revolutionary” period. Cannon evolved for a full century before they were able dramatically to change the European way of war, and they continued to improve steadily (if slowly) for centuries after–ward.154 But the concept of evolution, as commonly conceived, does not adequately address the critical period of rapid innovation from 1410 to 1430. There is a paradigm, however, which may be able to provide a conceptual framework broad enough and sturdy enough to support analysis of the diverse events which must go into an explanation of the growth of Western military superiority. In 1972, Stephen Jay Gould and Niles Eldredge proposed a new model for the evolutionary formation of species, which they dubbed “punctuated equilibrium.” They argued that evolution proceeded by short bursts of rapid change interspersed with long periods of near stasis rather than constant, slow alteration. Their theory aroused much controversy, and over the intervening years it has become clear that their initial formulation did not give sufficient play to gradual, incremental change. 155 But many scientists have accepted Gould and Eldredge’s basic point – that much, though not all, evolutionary change occurs during short periods of rapid development. This newer conception of punctuated equilibrium evolution, combining both incremental and “revolutionary” change, seems to describe the process of military innovation extraordinarily well. After a long period of near-stasis, infantry began to evolve very rapidly around the beginning of the fourteenth century. Cannon appeared at about that time, evolved incrementally for a century, then in a burst of rapid advancement revolutionized war in Europe. Artillery fortifications began to develop at about the same time as artillery reached its height; 156 evolved gradually over the course of a century; then in their turn effected a military revolution. A similar process of punctuated equilibrium evolution in military technology continues even today. It might be argued that, so long as we all know what we are talking about when we say “Military Revolution,” my objections are mere quibbling, only a question of semantics. But, as George Orwell showed so effectively in 1984, words shape ideas, and ideas shape the world. By attempting to subsume the innovations of five centuries into a single phenomenon, we may be imposing an artificial teleological unity onto a series of inherently distinct, separate developments. And, in doing so, we may be clouding our understanding of a critically important area of history, an area which fully deserves to be studied through the clearest possible lens. 1. A number of scholars have been kind enough to read drafts of this article and offer me their corrections and comments: thanks are especially due to John F. Guilmartin, Jr.; Andrew Ayton; Russell Hart; Geoffrey Parker; John Lynn; Williamson Murray; and the students in the Ohio State University seminar on “Technologically Oriented Military History” (Winter-Spring 1991), particularly Capt. Peter Mansoor. Thanks are also due to the Ohio State University for the Research and Graduate Council Fellowship which supported me while I researched and wrote this article, and the U.S.- U.K. Fulbright Commission for the grant which enabled me to put the finishing touches on it. 2. Stephen Glick has pointed out, however, that Sir Charles Oman may have prior claim to the concept: Oman’s 1898 essay, The Art of War in the Middle Ages, refers to the time when pike-and-shot infantry took the premiere part in withstanding the Ottomans as “the military revolution of the sixteenth century.” C. W C. Oman, The Art of War in the Middle Ages, revised and edited by John H. Beeler (Ithaca, N.Y: Cornell University Press, 1953), 162. 3. Michael Roberts, “The Military Revolution, 1560-1660,” reprinted in his Essays in Swedish History (Minneapolis: University of Minnesota Press, 1967). 4. Geoffrey Parker, “The `Military Revolution,’ 1560-1660-a myth?,” Journal of Modern History 48 (1976): 195n. ; Geoffrey Parker, The Military Revolution: Military Innovation and the Rise of the West (Cambridge: Cambridge University Press, 1988), 2. 5. Parker, “The `Military Revolution,”‘ 214, et passim. 6. E.g., Michael Duffy, ed., The Military Revolution and the State, 1500-1800, Exeter Studies in History 1 (Exeter: University of Exeter, 1980), 3; John A. Lynn, “The Growth of the French Army During the Seventeenth Century” Armed Forces and Society 6 (1980). Cf. William H. McNeill, The Pursuit of Power (Chicago: University of Chicago Press, 1982), Chs. 3 and 4, and John Lynn’s review article, “Clio in Arms,” Journal of Military History 55 (January 1991). 7. Parker, Military Revolution, 4. All the participants on the Military Revolution Roundtable at the 1991 American Military Institute conference in Durham, NCi.e., myself, John F. Guilmartin, John A. Lynn, and Geoffrey Parker-agreed on the centrality of this question. 8. Previously cited works by Roberts, Parker, Duffy. Others include: John A. Lynn, “The trace italienne and the Growth of Armies: The French Case,” Journal of Military History 55 (July 1991); Simon Adams, “Tactics or Politics? `The Military Revolution’ and the Hapsburg Hegemony, 1525-1648,” in The Tools of War, ed. J. A. Lynn (Champaign: University of Illinois Press, 1990); David A. Parrott, “Strategy and Tactics in the Thirty Years’ War: The `Military Revolution,”‘ Militargeschichtliche Mitteilungen 18 (1985); and Jeremy Black’s new book, A Military Revolution? Military Change and European Society, 1550-1800 (Atlantic Highlands, N.J.: Humanities Press, 1990), which emphasizes the military changes which took place in the century after 1660. His work, though it seriously underestimates the military changes of the sixteenth century, does have important contributions to make for the seventeenth- and eighteenth-century phases of the process of Western military innovation which fit nicely with the “punctuated equilibrium evolution” model which I will develop later in this article. 9. They held primacy in importance, though often not in numbers. This statement will be developed further below. For the area between the Loire and the Rhine, feudal armies exercised their dominance from even farther back-from Carolingian times-but by mid-eleventh century (i.e., after 1066) feudal warfare was well established in England, Italy, and Germany as well. 10. In the twelfth century, many battles were fought by dismounted cavalry, but there is a difference between dismounted cavalry and infantry, especially “common” (i.e., non-aristocratic) infantry. See below. 11. Parker, Military Revolution, 118, points out that this last was an important difference between the Europeans and many of those whom they sought to subdue. 12. This term has been used by John F. Guilmartin in his article “War, Technology of” in the 1991 Encyclopaedia Britannica, 539. He uses it, however, to refer to the progress of infantry over the entire period c. 1200-1500, whereas I limit it to the rapid and revolutionary rise to prominence of infantry in the years c. 1302-46. 13. I will not make any attempt to produce a developed explanation of why this process of punctuated equilibrium military evolution “took off” in the West and not elsewhere in the world. I suspect that the answer has something to do with the combination of two factors: (1) the fragmented and competitive political structure of Europe; (2) the technological orientation towards problem solving which appeared in Europe in the High Middle Ages. The former provided the need for military innovation; the latter helped provide the means. 16. J. F. Verbruggen, The Art of Warfare in Western Europe During the Middle Ages: From the Eighth Century to 1340 (Amsterdam: North Holland Publishing Co., 1977), 23; cf. Philippe Contamine, War in the Middle Ages, tr. Michael Jones (London: Basil Blackwell, 1984), 31. For a particularly well-balanced case study of the role of infantry in high medieval warfare, see R. C. Smail, Crusading Warfare (1097-1193) (Cambridge: Cambridge University Press, 1956), especially 116-30. 17. Smail, Crusading Warfare, 128-30, says this tactic was in common use during the Crusades. Perhaps the most vivid descriptions of it are found in Guillaume le Breton’s account of the battle of Bouvines (1214); Beha al-Din’s description of Richard I’s forces at Arsuf (in Verbruggen, Art of Warfare, 215, 218), and especially Al-Heweri’s description of the “Franks” in his military treatise of 1211 (in H. Ritter, “La Parure des Cavaliers and die Literatur uber die ritterlichen Kunste,” Der Islam 18 (1929): 147). 18. See R. Allen Brown, “The Status of the Norman Knight,” in War and Government in the Middle Ages, ed. John Gillingham and J. C. Holt (Woodbridge, Suffolk: Boydell Press, 1984), 29, and Verbruggen, Art of Warfare, 28-39. 19. The Chanson de Guillaume implicitly recognized the connection between diet and military prowess: “By God, fair sire, he’s of your line indeed,/Who thus devours a mighty haunch of boar/And drinks of wine a gallon at two gulps;/pity the man on whom he wages war.” Although it deals with a different period, Geoffrey and Angela Parker’s European Soldiers, 1550-1650 (Cambridge: Cambridge University Press, 1977), 22, gives some interesting statistics on this point. It seems that in that period, fewer than one common recruit in thirty was over five feet tall. 20. Richelieu was by no means the first to observe that “history knows more armies ruined by want and disorder than by the efforts of their enemies”; the same principle is emphasized in the military treatise of Vegetius, which was very popular in the Middle Ages. Geoffrey Lester, ed., The Earliest English Translation of Vegetius’ De Re Militari (Heidelberg: Carl Winter Universitatsverlag, 1988), 156, 158. For an outstanding discussion of strategy in the High Middle Ages, which will help make clear the importance of this capacity, see John Gillingham, “Richard I and the Science of War in the Middle Ages,” in Gillingham and Holt, eds., War and Government in the Middle Ages. 21. The “equipment” included a warhorse, palfrey, packhorse, armor, weapons, etc. The high cost of his equipment was reflected in the high wages he received when serving at his lord’s expense. See note 43, below. 22. See the Calendar of Inquisitions, Miscellaneous. VII (1399-1422) (London: 1968), 29, 61, 313; 32, 276, 188. Compare PRO E101/392/13. 23. In this context it is worth quoting Petrarch (b. 1304), who wrote: “In my youth, the Britons, who are called Angles or English, were taken to be the meekest of the barbarians. Today they are a fiercely bellicose nation. They have overturned the ancient military glory of the French by victories so numerous that they, who once were inferior to the wretched Scots, have reduced the entire kingdom of France by fire and sword.” Quoted in R. Boutruche, “The Devastation of Rural Areas During the Hundred Years’ War and the Agricultural Recovery of France,” in The Recovery of France in the Fifteenth Century, ed. P. S. Lewis (New York: Macmillan, 1972). Note that the reason the English were once inferior to the Scots is that the latter perceived the potential of the Infantry Revolution before their southern neighbors, just as the English appreciated it before the French. Cf. Jean le Bel’s similar comment: Chronique de Jean le Bel, ed. J. Viard and E. Deprez (Paris: SHF, 1904), 1:155-56. 24. Cf. Pierre Dubois’s treatise, quoted in Verbruggen, Art of Warfare, 273. 25. The Scots, too, had an important role to play in the Infantry Revolution. Although not enemies of the French, the Scots suffered an equivalent inferiority in heavy cavalry vis-a-vis their traditional opponents, the English. 26. For Courtrai, see Verbruggen, Art of Warfare, 166-73. For Bannockburn, see J. E. Morris, Bannockburn (Cambridge, 1914). The account in Thomas Gray’s Scalacronica, ed. J. Stevenson (Edinburgh: Maitland Club, 1836) is not very detailed, but it does note that the Scots at Bannockburn were specifically following the example of the Flemings at Courtrai, who had defeated the French forces by fighting on foot (p. 142). 27. Thomas Wright, The Political Songs of England, vol. III (Edinburgh: Privately printed, 1884), 43. 28. The battle of Bannockburn took place on “an evil, deep morass” on a very narrow front. Scalacronica, 142; John Barbour, The Bruce, ed. W. W. Skeat (Early English Text Society, 1889), 299. According to Oman, “the infantry of the Great Company in the east beat the Duke of Athens (A.D. 1311), by inducing him to charge with all his men-at-arms into a swamp.” These four battles, all fought within the brief span of thirteen years, show a remarkable similarity. Taking into account Thomas Gray’s comment (see note 26), I suspect that the later three battles were conscious attempts to replicate the success of the Flemings in 1302. Furthermore, the Scots at least believed (and almost certainly correctly) that the English had learned the advantages of fighting on foot from their defeat at Bannockburn. The French experiments with infantry tactics, in turn, were undertaken in imitation of the successful English. Cf. Geoffrey le Baker, Chronicon, ed. E. M. Thompson (Oxford: Clarendon, 1889), 143. 29. For Cassel, see le Bel, Chronique, 1:93-94, and Ferdinand Lot, L’Art Militaire et les Armees au Moyen Age (Paris: Payot, 1946), 274-78. For Mons-en-Pevel, see Verbruggen, Art of Warfare, 176-83. 31. Pun quite intended. For Crecy, see le Bel, Chronique, 2:99 et seq., and le Baker, Chronicon, 82-85. Froissart, Oeuvres, 5:37-78. Alfred H. Burne, The Crecy War (Westport, Conn.: Greenwood Press, 1976), Chapter 7. 32. Although a cavalry reserve was often kept for pursuits or special tasks, such as attempting to ride down the English archers, as at Poitiers in 1356. 33. “The Design and Materials of the Bow,” in Robert Hardy, Longbow: A Social and Military History (Cambridge: Patrick Stephens, 1976), 195. 34. See the illustrations reproduced in Bradbury, Medieval Archer. The Norman archers at Hastings, if we can trust the depictions of the Bayeux Tapestry, also used short bows drawn to the chest (Bradbury, 32-34). It is interesting to note that both the Normans and the Welsh are clearly depicted as using a two-fingered draw, rather than the three-fingered draw used by longbowmen during the Hundred Years’ War, indicating a weaker bow in the earlier period. 35. See Jean de Joinville, Chronicle, in Sir Frank Marzials, ed., Memoirs of the Crusades (London: Everyman’s Library, 1964), 195, and Beha al-Din’s account of Arsuf, quoted in Verbruggen, Art of Warfare, 215. Of course, these were composite recurved shortbows, but since they were more powerful than the Welsh selfbows, the point stands. The effects of the English archers’ arrows at Crecy, Poitiers, Verneuil, or Agincourt were much more serious. E.g., see Chronographia Regum Francorum (Paris: SHF, 1891), 2:232. 37. A failure to take into account the great strength needed to use a medieval longbow effectively has led many authors into the mistaken conclusion that a soldier could be trained to its use with relative ease. E.g., see Richard Barber, The Knight and Chivalry (Ipswich: Boydell Press, 1974), 199. 38. Bradbury’s estimate of 50 lbs. as a typical medieval draw weight is far too low, and would not have produced the high pressures which caused the skeletal deformation of the archers on the wreck of the Tudor warship Mary Rose compressed left forearms, twisted spines, and flattened draw-fingers. Guilmartin, “War, Technology of,” 541; Bradbury, Medieval Archer, 148, 157. Cf. Hardy, Longbow, 53. Robert Hardy revealed in a paper presented at the Hundred Years’ War conference held at Oxford University, 8-10 November 1991, that the 138 longbows recovered from the Mary Rose ranged in power from 100-180 (!) pounds draw weight. 39. For a good discussion of the human element of archery, see John F. Guilmartin, Gunpowder and Galleys (Cambridge: Cambridge University Press, 1974), 151. 40. In 1384, for example, Charles VI of France prohibited any games except those involving the longbow or crossbow. Contamine, War, 217. Cf. note 51, below. 41. The beauty of the English archer and man-at-arms combination was that it could convert either into an offensively powerful cavalry-and-missile combination when used against infantry fighting on the defensive (e.g. vs. the Scottish schiltrons at Falkirk), or into an equally effective defensive “pike-and-shot” combination to destroy attacking cavalry and infantry forces (e.g., at Crecy, Agincourt). In the latter case, the archers’ fire served to disorder and demoralize the attacking forces (when it did not wound or kill) before they smashed into the steady, tightly formed men-at-arms. 42. Here, and throughout this paper, “common infantry” refers to infantry drawn from nonaristocratic classes. I also consider troops like the English mounted archers, who rode from place to place but invariably fought on foot, as they had neither the training nor the mounts to fight on horseback, to be essentially infantry rather than cavalry. A mounted archer’s horse could be had for £2 (E101/397/5), while a knight would likely spend at least ten times that amount for a courser, palfrey, and rouncy (E101/19/36). 43. A very important consideration when victory in war often went to the side with the last reserves of money. In 1326, for example, an English knight bachelor was paid twelve times as much as a footman (2s/day vs. 2d/day). 44. Although this advantage was less pronounced for longbowmen, who required years of training to build up the strength to use their bows. 45. The broader social base from which infantry forces were drawn became crucial later in the “military revolution” of the sixteenth and seventeenth centuries. From the mid-sixteenth to the end of the seventeenth century, the French army grew from a maximum wartime strength of about 50,000 to one of about 400,000 (Parker, The Military Revolution, 24). Virtually every man of the 350,000 added came from the common population: as late as 1775, the total number of gentilshommes employed by the French military, including the navy and retired officers, was only 20-25,000 (Duffy, Military Revolution and the State, 4). 46. By the end of the Hundred Years’ War, the Berry Herald precociously described the English as follows: they “are all good archers and soldiers …. They also make war on all nations of the world by sea and land and all that they gain in the foreign parts to which they have gone they send back to their realm and through this it is rich.” Quoted in Contamine, War, 125. The Swiss, of course, also exported large numbers of mercenary infantrymen. 47. Stanislav Andreski provides an outstanding theoretical treatment of the relationship between military and political enfranchisement in his Military Organization and Society (London: Routledge and Kegan Paul, 1968). 49. Cf. G. J. Aungier, ed., French Chronicle of London, Camden Series, 28 (1844): 83. 50. Froissart, Chronicles, 5 vols., tr. Thomas Johnes (Haford: Haford Press, 1803), 2:469, 477, 479. 51. Jean Juvenal des Ursins, Histoire de Charles VI, in Choix de chroniques et memoires sur l’histoire de France. XIVe siecle (Paris: Pantheon Litteraire, 1838), 385. See Rymer, Foedera, vol. III, pars. 2, 704, for the very different English royal attitude. 52. But cf. Thomas N. Bisson, “The Military Origins of Medieval Representation,” American Historical Review 71 (1966): 1207. 53. One fifteenth-century list of participants in a Parliamentary election, for example, includes 1 knight, 8 esquires, 10 “gentilmen,” and 105 common freemen. See J. G. Edwards, “The Huntingdonshire Parliamentary Election of 1450,” in Essays in Medieval History Presented to Bertie Wilkinson, ed. T. A. Sandquist and M. R. Powicke (Toronto: University of Toronto Press, 1969), 385. One poem written around 1400, emphasizes the role of good “schire-knyghtis” as mere representatives of the electorate: “We are servants taking a salary and sent from the shires to show their grievances and to speak for their profit . . . and if we are false to those who send us here, then little are we worthy of our hire.” Mum and the Sothsegger, ed. Mabel Day and Robert Steele (London: Early English Text Society, 1936), 24-25. 54. For a good survey of the early development of the English Parliament, see G. L. Harris, “The Formation of Parliament, 1272-1377,” in R. G. Davies, ed., The English Parliament in the Middle Ages (Manchester: Manchester University Press, 1981) For the early development of the longbow and tactics based on its use, see Hardy, Longbow, 36-49. 55. Cf. G. Edwards, “Huntingdonshire Parliamentary Election of 1450,” 38, for the Parliamentary side; for the military side, see the Lanercost Chronicle’s description of Dupplin Muir and Halidon Hill, and Froissart’s descriptions of Cadzand, Hennebon, Quimperle, Bergerac, Auberoche, and Crecy, all in the first two decades of Edward’s long rule. 56. G. Edwards, “Huntingdonshire Parliamentary Election of 1450,” 49. G. L. Harriss, King, Parliament, and Public Finance in Medieval England to 1369 (Oxford: Clarendon Press, 1975), 259, 320, 359. 57. G. Edwards, “Huntingdonshire Parliamentary Election of 1450,” 19-21. This was of great importance, as indirect taxation was then replacing direct subsidies as the largest source of royal income, as the research of Mark Ormrod is showing. 58. The increasing economic importance of the towns also played a part in their gain in political power, but wealth can only be exchanged for power if the transaction is protected by force: otherwise, he who holds the power is likely to take the wealth without making political concessions. 59. For the 40s. voting qualification, see Rotuli Parliamentorum, 4:350. Cf. S. J. Payling, “The Widening Franchise-Parliamentary Elections in Lancastrian Nottinghamshire,” in England in the Fifteenth Century, ed. Daniel Williams (Woodbridge, Suffolk: Boydell Press, 1987), and G. Edwards, “Huntingdonshire Parliamentary Election of 1450,” 386. For the 40s. “archer class,” see Michael Powicke, Military Obligation in Medieval England (Oxford University Press, 1962), 193, 182, 190. During the same period, a horse archer’s annual wage was nearly five times that amount, which shows that it was indeed a very moderate property qualification. 60. Verbruggen, Art of Warfare, 132. 61. Contamine, War in the Middle Ages, 256. 62. Ibid. Lot, L’Art Militaire, 1: 223-35; Joseph Dahmus, Seven Decisive Battles of the Middle Ages (Chicago: Nelson-Hall, 1983), 167. 63. Orderic Vitalis, Ecclesiastical History, tr. Marjorie Chibnall (Oxford: Clarendon Press, 1969), 6: 241. 65. Alfred H. Burne, The Agincourt War (London: Eyre and Spottiswoode, 1956), 87, 210. The French casualties at Crecy were similar: 1,542 men-at-arms and an uncertain number of commoners. Burne, The Crecy War, 184. At Poitiers, over 2,000 knights and men-at-arms lost their lives. Ibid., 307. 66. Orderic Vitalis, Ecclesiastical History, 6:241. 67. Excluding customs revenue. Harriss, 523-26. “Ordinary” revenue does not include the direct taxes on movable wealth granted intermittently by Parliament. 68. Jonathan Sumption, The Hundred Years War, volume 1, Trial by Battle (London: Faber and Faber, 1990), 470. Philippe Contamine, “Rancons et butins dans la Normandie anglaise (1424-1444),” in his La France aux XIVe et XVe siecles. Hommes, mentalites, guerre et paix (London: Valorium Reprints, 1981), 260. 69. Froissart, Oeuvres, 10: 171. In the same battle, the Flemings’ leader com–manded his troops under pain of death to take no prisoners, but “Kill all, kill all,” ibid., 158. Cf. 4:406 (“ces archiers qui tuoient gens sans merchy et sans deffensce”) and Chronicles, 1:306, 325, 2:356-57, 432, 448, 599, 609, etc., and Verbruggen, Art of Warfare, 170. Similarly, the Scottish men-at-arms who rode down the English archers at Bannockburn “slayand thamme without ransounne.” Such a slaughter had been seen “neuir quhar, in na cuntre.” Barbour, The Bruce, 308 (cf. 319). 70. Commanders often made ordinances to prevent this from happening. An Anglo-Burgundian ordinance of 1423, for instance, stated that “no person, whatever might be his rank, should dare attempt making any prisoners on the day of the battle until the field should be fairly won. Should any such be made, the prisoner was to be instantly put to death, and with him the person who had taken him, should he refuse to obey.” Enguerrand de Monstrelet, Chronicles, tr. Thomas Johnes (London: William Smith, 1840), 500. Similar ordinances were made by the English at Crecy and the Flemings at Roosebeke. 71. When the graves of those killed by the Swiss at the battle of Sempach were opened at the end of the nineteenth century, it was found that “the skulls were nearly all dreadfully split by halberd-strokes.” C. W C. Oman, A History of the Art of War in the Middle Ages (London: Meuthen, 1924), 251 n. Cf. Froissart on Roosebeke: Oeuvres, 10: 170. See Matthew Bennett, “La Regle du Temple as a Military Manual or How to Deliver a Cavalry Charge,” in Studies in Medieval History Presented to R. Allen Brown (Woodbridge, Suffolk: Boydell Press, 1989), 17, for some interesting observations on the very different mechanics of cavalry vs. cavalry fights. 73. There is a good color reproduction of one of the Milemete guns in Richard Humble, Warfare in the Middle Ages (Leicester: Magna Books, 1989), 147. J. R. Partington, A History of Greek Fire and Gunpowder (Cambridge: W. Heffer and Sons, 1960), 105, gives what purports to be a Florentine provisione, also of 1326, for the acquisition of cannon and iron balls for the defense of the Republic. The document is questionable, however: its “discoverer” was later sentenced to ten years in prison for stealing documents, altering them to make them seem more valuable, and then reselling them. See Bernhard Rathgen, Das Aufkommen der Pulverwaffe (Munich: Verlag Die Schwere Artillerie, 1925), 15. 74. Called “vasa” and a “scolpo.” Rathgen, Aufkommen der Pulverwaffe, 14. 75. The Brut, or the Chronicles of England, ed. F. W. Brie (London: Early English Text Society, 1960), 282, version “0”. 76. The same was true at the siege of Calais in 1346, where: “Gonners to schew their art/Into the town in many a parte/Schot many a fulle great stone.” Quoted in Lt. Col. H. W L. Hime, The Origin. of Artillery (London: Longmans, Green and Co., 1915), 172. 77. T. F. Tout, “Firearms in England in the Fourteenth Century,” EHR 26 (1911): 682-83; cf. Rathgen, Aufkommen der Pulverwaffe, 36. Of course, guns were much more expensive than older forms of artillery to operate, if not to purchase, because of the very high cost of gunpowder. 78. Tout, “Firearms in England in the Fourteenth Century,” 689-91. 79. For Cahors: Napoleon III and I. Fave, Etudes sur le passe et l’avenir de l’Artillerie (Paris: J. Dumaine, 1846-71), 3:82n. For St.Saveur: ibid., 4: pieces justificatives, xviii-xlii. The largest of these guns required 2,385 lb. of iron and steel to manufacture, but most were much smaller guns of cast bronze. 80. Froissart, Chronicles, 2: 246. Perugia, similarly, had five hundred “bombarde” made in 1364, but each was only a handspan long. Rathgen, Aufkommen der Pulverwaffe, 37. 81. Tout, “Firearms in England in the Fourteenth Century,” 677-‑78. 82. Christine de Pisan, The Book of Fayttes of Armes and of Chyvalrye, tr. William Caxton, ed. A. T. P Byles (London: Early English Text Society, 1937), 153-54. The largest of the guns was to throw five-hundred-pound shot. Although she claimed to have based her list on the advice of “wyse knyghtes that be expert in the sayde thynges of armes,” this seems to be a rather extreme number. By comparison, the large and well-provided Bohemian armies besieging Carlstein in 1422 had only fifty-two guns, of which six were very large (Wenceslai Hagecii, Bohmische Chronica [(Cadan: J. S. Zluticensem, 1596) ], fo. 114v); and the artillery train purchased for the Earl of Salisbury in 1428 comprised just seventy-two guns, of which only seven fired 100+ lb. shot (PRO: Exchequer, Accounts Various [(E101) ], 51/27, 30). 83. M. Lander, ed. Cent cinquante textes sur la guerre de Cent Ans dans le bailliage de Cotentin (St.-Lo, 1978), 140; Froissart, Oeuvres, 18: 411; Karl Jacobs, Das Aufkommen der Feuerwaffen am Niederrhein bis zum Jahre 1400 (Bonn: Peter Hanstein, 1910), 56, 86. 84. Joseph Garnier, L’Artillerie des Dues de Bourgogne, d’apres les documents conserves aux archives de la Cote-d’Or (Paris: Honore Champion, 1895), 26-27, 265. 1 am indebted to Kelly DeVries for advising me of this valuable source. 85. W Hassenstein, ed., Das Feuerwerkbuch von 1420 (Munich: Verlag der Deutschen Technik, 1941), 145. Schmidtchen, Bombarden, Befestigungen, Buchsenmeister, 32. Note that 80 centimeters is nearly twice the diameter of the shells fired by the 16-inch main guns of twentieth-century battleships. 86. Froissart, Oeuvres, 5:389, 376. In both cases the guns shot both fire and large bolts. Cannon were also used to drive the French besiegers away from Quesnoy in 1340. 87. Froissart, Chronicles, 2:246, 250. Chronique de Du Guesclin, ed. M. Fr. Michel (Paris: Bibliotheque Choisie, 1830), 121. 88. Hassenstein, Feuerwerhbuch von 1420, 31. Cf. the Royal Armouries Firework Manuscript, Royal Armouries Library (Tower of London), MS 1-34, fo. 36v-37v. For a concrete example, see the siege of Bourges in 1411, where an assault was driven off by fierce cannonfire. Pierre de Fenin, Memoires, ed. Dupont (Paris: SHF, 1837), 27. 89. The quotes are from the English Chronicle of the Reigns of Richard II, Henry IV, Henry V, and Henry VI (London: Camden Society, 1868), 40, and the Pseudo-Elmham, Vita et Gesta Henrici Quinti, ed. and tr. Frank Taylor and John S. Roskell (Oxford: Oxford University Press, 1975), 39. The number of Henry’s guns is given in a contemporary letter; see Burne, Agincourt, 36. The reference to tennis alludes to the story of the tennis balls mockingly sent to Henry V by the French Dauphin. 90. John Capgrave, The Chronicle of England, ed. F. C. Hingeston (London: Rolls Series, 1858), 310; Chronique Normande, in Henrici Quinti, Angliae Regis, Gesta, ed. Benjamin Williams (London: English Historical Society, 1850), 168. 91. Vita et Gesta Henrici Quinti, 37; English Chronicle of the Reigns of Richard II, Henry IV, Henry V, and Henry VI; Sir Harris Nicolas, History of the Battle of Agincourt (London: Johnson and Co., 1832), 310. 92. Vita et Gesta Henrici Quinti, 39. 93. Contra the argument of B. H. St. J. ONeil that “in the years 1369 to 1375, the French were able to batter down walls of fortresses both successfully and quickly.” Castles and Cannon (Oxford: Claredon, 1960), 33; cf. a similar statement in Rathgen, Aufkommen der Pulverwaffe, 4. 95. A poem written by an eyewitness to the siege, John Page, eloquently expresses the supply problems of the townsmen: “They etete doggys, they ete cattys;/They ete mysse, horse and rattys/. . ./For xxxd. went a ratte/For ij noblys went a catte./For vj d. went a mous;/They lefte but fewe in any house.” Poem on the Siege of Rouen in The Historical Collections of a Citizen of London in the Fifteenth Century, 18 (Cf. 38). See also Monstrelet, Chronicles, 1:404, and the Chronique Normande, 191. 96. Chronique Normande, 191, 202; John Holinshed, Holinshed’s Chronicles: Richard II 1398-1400, Henry IV and Henry V, ed. R. S. Wallace and A. Hansen (Oxford: Clarenden, 1928), 64-65, 109, 123-27; J. H. Wylie and W T. Waugh, The Reign of Henry the Fifth (Cambridge: Cambridge University Press, 1929), 3: 107-9, 210-15, 351. Louis Bellaguet, ed., Chronique du religieux de St. Denys (1380-1422) (Paris: Crapelet, 1839), 6:446-48; Monstrelet, Chronicles, 421, 468-76, 498, 508-22; Thomas Gregory, Gregory’s Chronicle in Historical Collections of a London Citizen, ed. J. Gairdner (London: Camden Society, 1876), 148; Jehan de Waurin, Recueil des Croniques et anchiennes Istories de la Grant Bretaigne, ed. William Hardy (London: Rolls Series, 1879), 3:32; R. A. Newhall, The English Conquest of Normandy, 1416-24 (New Haven: Yale University Press, 1924), 131. 97. Although Waurin, 2:394, 401, and Fenin (Memoires, 174) emphasize the role of the artillery at Meaux. 98. There are several earlier examples of significant artillery successes, but these, in terms of the artillery revolution, are analogous to the harbinger infantry victories of Courtrai, Bannockburn, and Morgarten in that they were only possible because of special circumstances. In 1405, Henry IV’s bombards flattened a sub–stantial portion of the walls of Berwick (British Library, MS Vespasian FVII, f. 71), but from the south side where the fortifications were so low and so thin “that a man may stand within the wall and take another by the hand without the wall.” James Wylie, History of England under Henry the Fourth (London: Longmans, Green and Co., 1884-98), 2: 271. The walls were in any case falling down for “verray feblesse.” S. B. Chrimes, “Some Letters of John of Lancaster as Warden of the East Marches towards Scotland,” Speculum 14 (1939): 20. Two years after that, Spanish “lombardas” were “demolishing a great part of the wall” of Zahara when the garrison surrendered . . . but the Moors had only recently begun to repair the fortifications of the town. Fernan Perez de Guzman, Cronica del serenissimo rey don Juan el segundo deste nombre [of Aragon] (1517), cap. xxxv-vi. 99. Le Mans, Sainte-Suzanne, Mayenne-la-Juhez: Jean Chartier, Chronique de Charles VII, ed. Vallet de Viriville (Paris: P. Jannet, 1858), 1: 45-47. Cf. Guillaume Cousinot, Chronique de la Pucelle, ed. V. de Viriville (Paris: Garnier Freres, 1892), 199-200. For Montmiral and Gallardon: Chronique du religieux de Saint-Denys, vi, 463. Artillery was equally effective at Quesnoy in 1421, but the place was only poorly fortified. See Waurin, 2:395-96. 100. Chartier, Chronique de Charles VII. The meaning of the last part of the sentence is unclear; it may mean that the guns made a breach in the wall more than a bow-shot wide. 102. 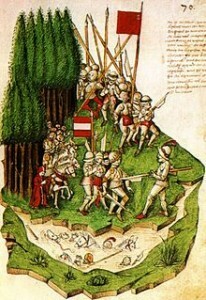 Franz Palacky, Urkundliche Beitrage zur Geschichte des Hussitenkrieges vom Jahre 1419 an (Prague: E. Tempsky, 1873), 151. 103. Monstrelet, Chronicles, 1: 566; Waurin, 3:346, 348.; Chartier, Chronique de Charles VII, 1: 47, 143-46; A. J. Pollard, John Talbot and the War in France, 1427-1453 (London: Royal Historical Society, 1983), 53. Burne (The Agincourt War, 291) has the siege of Harfleur opening in August rather than July, which would make it just under three months, and the chroniclers (e.g., Chartier, Chronique de Charles VII, 1: 259) generally have the siege beginning in April, which would make it six months. 104. Monstrelet, Chronicles, 1: 570, 619. 105. Description of the newly recaptured castle of Castelnau-de-Cernes in a grant by Henry VI. Malcolm Vale, War and Chivalry (London: Ducksworth, 1981), 132. 106. Charles VII made use of sixteen large bombards for the siege. Chartier, Chronique de Charles VII, 2:178-79. 107. Ibid., 2: 205; Guillaume Leseur, Histoire de Gaston IV, comte de Foix, ed. H. Courteault (Paris: SHF, 1893-96), 119-21; Chartier, Chronique de Charles VII, 2: 254-56. 108. J. Stevenson, ed. Letters and Papers Illustrative of the Wars of the English in France during the Reign of Henry the Sixth, King of England (London: Rolls Series, 1861-64), 619 et seq. Most of the one hundred strongpoints referred to were actually never besieged; they surrendered rather than make a hopeless attempt to resist. 109. Leseur, Histoire de Gaston IV, 119-20. 110. Chartier, Chronique de Charles VII, 2: 235-38. He adds that the French could have taken by assault any of the places which surrendered if they had wanted to. 111. Jean de Bueil, Le Jouvencel, ed. Leon Lecestre (Paris: SHF, 1887), 37. 112. Vita et Gesta Henrici Quinti, 37. 113. For the first, see O’Neil, Castles and Cannon, 24, and H. Dubled, “L’artillerie royale francaise a 1’epoque de Charles VII et au debut du regne de Louis XI (1437-69); les freres Bureau,” Memorial de l’Artillerie francaise 50 (1976), 563. For the second, see Dubled, passim, and Napoleon and Fave, Etudes sur le passe et l’avenir de l’Artillerie, 2:99. 114. Schmidtchen, Bombarden, Befestigungen, Buchsenmeister, 17-18, 49. The master-gunner’s book of 1411 in the Austrian National Library (Codex 3069, ff. 9v, 19v, cf. fo. 31) shows similarly proportioned guns. For bombards from the late 1430s on, in contrast, a barrel:ball ratio of 5:1, as recommended in the Feuerwerkbuch, seems to have been typical. 115. Hassenstein, Feuerwerkbuch von 1420, 71; Schmidtchen, Bombarden, Befestigungen, Buchsenmeister, 50-51. 116. It is described in detail in Codex 3069 of the Austrian National Library (written 1411), fos. 8v-9v. Cf. the nearly identical text (taken from Munich CGM 600) in Gustav Kohler, Die Entwicklung des Kriegswesens and der Kriegfehrung in der Ritterzeit (Breslau: W Koebner, 1887), 231. 117. Fowlers and other smaller guns, however, usually had longer barrels with removable powder chambers shaped like beer steins, of which each gun was supplied with two or more. These could be loaded from the breech; the balls did not need to be wedged nor sealed in place; and the chambers could be kept pre-prepared and replaced without waiting for the gun to cool fully. Thus they could fire much faster. 118. Schmidtchen, Bombarden, Befestigungen, Buchsenmeister, 44 (re. 1437). It seems from a few pieces of evidence, however, that a maximum of six to eight shots per day could be fired from large bombards of the shorter-barrelled type (contra Schmidtchen, 44). Perez de Guzman, Cronica, cap. xli-xliii; Partington, History of Greek Fire and Gunpowder, 114; Hagecii, Bohmische Chronica, fo. 114v et seq. 119. Schmidtchen, Bombarden, Befestigungen, Biichsenmeister, 49-50, contra Dubled’s assertion that “the manner of loading artillery pieces hardly changed after the beginning of the [fifteenth] century” (p. 580). 120. The Amsterdam Bombard, probably one of the largest made by the spiral method, has a barrel length of 53 cm. and a caliber just slightly less. Thus, it would have fired a stone of about 400 Ibs. Jacobs, Aufhommen der Feuerwaffen, 68-71. 121. The best description of this process is in Robert D. Smith and Ruth Rhynas Brown, Bombards: Mons Meg and Her Sisters (London: Royal Armouries, 1989), 20. 122. Thus the “barrel” of a gun. 123. From the very first, smaller guns and some large ones were also cast of bronze (or other copper alloys). From 1422, cast iron guns also begin to appear in inventories occasionally, some of substantial size. Garnier, L’Artillerie des Ducs de Bourgogne, 267. 124. For example, see the 17,700 lbs. of iron used for making guns for Henry IV (PRO, Foreign Accounts, E364/43/6), or the 35,150 lbs. of iron used to make seven large guns for the Earl of Salisbury’s artillery train in 1428 (Accounts Various, E101/51/27). 125. Blast furnaces were in use in Belgium by 1340; by 1420 these were designed with separate hearths for firing and reheating. The Low Countries, in addition to being the center for the development of the blast furnace, were also the most important cannon-manufacturing area in Europe. See Alex den Ouden, “The Introduction and Early Spread of the Blast Furnace in Europe,” Wealden Iron Research Group Bulletin, No. 5, 2nd ser., 1985. Thanks to Robert D. Smith for bringing this article to my attention. 126. A. R. Williams, “Medieval Metalworking,” Chartered Mechanical Engineer, September 1978, passim. 127. T. F. Tout has shown that guns were generally priced by weight at 4d/lb. in the fourteenth century (Tout, “Firearms in England in the Fourteenth Century,” 682-83), but by the 1430s the price had fallen to about 3d/lb. The bombard “Bedford,” weighing 8,000 lb., was appraised at 1,000 l.t. in 1434, which works out to 2.5 s.t. (= 3.3 d. sterling) per pound (Stevenson, Letters and Papers, 566) Another great bombard, Mons Meg, was purchased in the 1450s by weight at 2 s.t. (2.66 d. sterling) per pound (Contamine, War, 49). The rate of 2 s.t. per pound also appears for a 4,000 lb. cannon in 1447 and a 12,000 lb. bombard in 1446 (Gamier, L’Artillerie des Ducs de Bourgogne, 57, 112). In England in 1428, the large iron guns purchased by John Parker, Master of the King’s Ordnance, went for 2.2 or 2.4 d. per pound (PRO E101/51/27, 30). Smaller guns generally went at even lower rates: by the end of the Hundred Years’ War, as low as 12-18 d.t. per pound. Gamier, L’Artillerie des Ducs de Bourgogne, 111, 115. 128. The paragraphs which follow offer a somewhat simplified history of the development of gunpowder after its introduction in Europe. As I intend to present the matter more fully in another article, I have kept the notes here to a minimum. 129. The ideal mix is about 75 percent saltpetre, 12 percent sulphur, and 13 percent charcoal. A widely used formula of c. 1400 called for 71/13/16 percents. See Napoleon and Fave, Etudes sur le passe et Pavenir de l’Artillerie, 3:107; Partington, History of Greek Fire and Gunpowder, 324. 130. E.g., the formulae in Hassenstein, Feuerwerkbuch von 1420, 61 et seq. (Cf. the Royal Armouries MS 1-35, fo. xxxxvi et seq. ); Gamier, L’Artillerie des Ducs de Bourgogne, 60; and Napoleon and Fave, Etudes sur le passe et l’avenir de l’Artillerie, 3:145-46. For a more extreme example, see ibid., 124. 131. For example, Jean Bureau expected to spend 2,200 l.t. to purchase powder in preparation for the 1443 campaigning season. Contamine, Guerre, 666. 132. Contra the universal claim (Hassenstein, Feuerwerkbuch von 1420, 84, 61; Schmidtchen, Bombarden, Befestigungen, Buchsenmeister, 46; Contamine, War, 197; Dubled, “L’artillerie royale francaise,” 571) that it was invented only c. 1420. See PRO, E101 (Exchequer: Accounts Various)/31/4, and Codex 3069 of the Austrian National Library, fo. 2, for (somewhat ambiguous) evidence of corned powder in England in 1372 and (fairly clear) in Germany in 1411. Napoleon and Fave, Etudes sur le passe et l’avenir de l’Artillerie, 3: 124, show that the use of the new type of powder was still not universal by 1417, however. 133. John F. Guilmartin, “Ballistics in the Black Powder Era,” in R. D. Smith, ed., British Naval Armaments (London: Royal Armouries, 1989), 87. The more rapid evolution into gas meant that more of the force of the explosion was produced before the shot left the barrel of the gun, and therefore applied to the ball. Tightly loaded serpentine powder burned like a single giant “corn” of powder, relatively slowly. 134. Austrian National Library, Codex 3069, fo. 2; Contamine, War, 197; Napoleon and Fave, Etudes sur le passe et l’avenir de l’Artillerie, 3:146. The author of the Feuerwerkbuch, which Hassenstein dates at c. 1420, more modestly claims that corned powder was half again as strong as sifted powder. Hassenstein, Feuerwerkbuch von 1420, 17; cf. Royal Armouries MS I-34, fo. 4v. 135. The bursting of cannon was fairly common in any case. At the siege of Aberistwyth in 1408, for example, the English lost their great guns “Neelpot” and “Messager” as well as two smaller cannon, shortly after bursting “Kyngesdoghter” at Harlech. PRO E364 (Foreign Accounts)/49/3. 136. Contra the assertion of J. R. Hale that firearms “had little effect on the fortunes of campaigns as a whole or on the balance of political power.” J. R. Hale, “Gunpowder and the Renaissance: An Essay in the History of Ideas,” in his Renaissance War Studies (London: Hambledon Press, 1983), 390. 137. For these changes, see Dubled, “L’artillerie royale francaise,” passim. 138. Hale, Renaissance War Studies, 389-90; McNeill, Pursuit of Power, 89; Lot, L’Art Militaire, 2: 466. 140. Quoted in Verbruggen, Art of Warfare, 273. DuBois exaggerated the difficulties of siege warfare somewhat – castles could rarely withstand a full year’s siege, and often fell within a few months or even weeks due to treachery or mines – but his essential point is valid. 141. The Military Revolution, 8. The knowledge of artillery developed by the Spanish and Portuguese in fighting the Moors transferred easily to Iberian conquests in the New World, Africa, and Asia: it was a short step from Reconquista to Conquista. 142. Guicciardini, History of Italy, ed. J. R. Hale, tr. Grayson (New York: Washington Square Press, 1964), 153. 143. From his Counsels and Reflections. Quoted in Parker, The Military Revolution, 10. Comparison of these quotes from Guicciardini with Pierre Dubois (see quotation in the text at footnote 140) will do much to answer the “critical” question John Keegan poses in the introduction to his The Mask of Command (New York: Elizabeth Sifton Books-Viking, 1987), 8: “whether there is an alternative style of . . . strategy not of conquest but of security, and if so, how and why it came to be supplanted.” Strategy based on conquest generally flourishes only when the balance in siege warfare lies with the offensive, as in c. 1420-c. 1520. 144. Cf. Guiccardini, “History of Florence,” in History of Italy, 20; and Felix Gilbert, “Machiavelli,” in Peter Paret, ed., Makers of Modern Strategy from Machiavelli to the Nuclear Age (Oxford: Clarendon Press, 1986), 23. 145. Though it is, of course, impossible to isolate the effects of the Artillery Revolution from other factors. 146. For the “artillery fortress,” see John Lynn, “The trace italienne.” For the decline in battle, see McNeill, Pursuit of Power, 91. The frequency of battle seems to be a good barometer of military revolutions. There was a certain surge in frequency c. 1300-1345 as the Infantry Revolution hit the stage, then another, greater one after the advent of the Artillery Revolution. Battle went out of favor with the Artillery Fortress Revolution of the early sixteenth century, but came back into favor with the “Gustavian” revolution a century later. This dialectic could perhaps be extended to the periods of Vauban, Napoleon, and the First and Second World Wars. 147. See Burne, Agincourt War, 319, and “Lettre sur la Bataille de Castillon en Perigord, 19 juillet 1453,” BEC 8 (1846): 246. 148. Cf. the closely related “coercion-extraction cycle” proposed by S. E. Finer in “State and Nation-Building in Europe: The Role of the Military,” in The Formation of National States in Western Europe, ed. C. Tilly (Princeton: Princeton University Press, 1975), 96. 149. McNeill, Pursuit of Power, 105n, citing Richard Bean, “War and the Birth of the Nation State,” Journal of Economic History, 1973, 33. 150. The quote is from Martin van Creveld, Technology and War from 2000 B.C. to the Present (New York: Free Press, 1989), 106. For similar statements, see Hale, Renaissance War Studies, 390-91, and Archer Jones, The Art of War in the Western World (Chicago: University of Illinois Press, 1987), 630. 151. Quoted in Gilbert, “Machiavelli,” 15. 152. To use William H. McNeill’s valuable concept. 153. One might continue this list with the changes in European military systems of the seventeenth century described in Jeremy Black’s book; the changes of the French Revolutionary period; of industrialized war; and of the nuclear revolution. Once the process of punctuated equilibrium evolution in the European craft of war got started, it never stopped. 154. With bursts of more rapid development in the early seventeenth and late nineteenth centuries. 155. For a concise but informative recent summary of the course of the punctuated equilibrium debate, see Tim Beardsly’s overview, “Punctuated Equi–librium: Darwin Survives as the Debate Evolves,” Scientific American 265 (March 1990). 156. Vale, War and Chivalry, 141-42; J. R. Hale, “The Early Development of the Bastion,” in Europe in the Late Middle Ages, ed. J. R. Hale (Evanston, Ill., 1965); Contamine, War, 203-4. This entry was posted in Articles and tagged 11C, 14C, 15C, Crossbows, Early Modern, France, High Middle Ages, Historiography, Hundred Years War, Italy, Late Medieval, Switzerland. Bookmark the permalink.